#4 Good Writing. Most writers will make an effort to have exact spelling, proper punctuation and correct grammar in their book proposals. Unfortunately, that doesn't guarantee that their writing will be clear. Former acquisition editor Steve Laube of Bethany House Publishers notes, "When book proposals come in, the sample chapters often have redundancies, fluff and padding. I like to see clear messages, straight-forward writing, and well organized structuring. Prose that needs paring isn't going to impress me." #5 Organization. 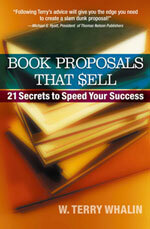 "Book proposals need a clear sense of organization," says Rich Willowby of Warner Press. "There needs to be a logical progression from one event to the next. I often make my authors ask of themselves, ‘What is it I'm trying to accomplish in this book?' I then make them summarize the whole book in one paragraph. After that, if there is anything in the book that doesn't fall in line with those early-established guidelines, it gets cut. This keeps the book on target and organized."